I’m starting a new series called “Real Ways to Earn Extra Money“. I’m so excited to share with you real-life experiences when it comes to earning extra money. 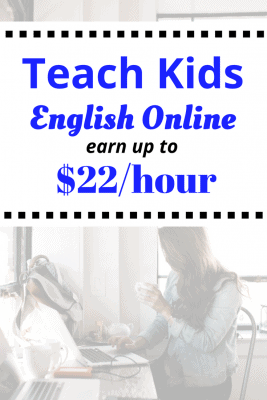 Did you know you can teach kids English online to earn extra income? Meet Jen. She got a side hustle to teach kids English online. Jen is a full-time 5th-grade teacher. In addition to her full-time job, she is teaching ESL to Chinese students for side income. She works for a company called VIPKID. With VIPKID you have the potential to earn up to $22 an hour! 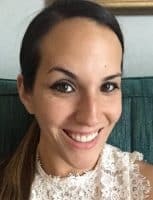 Jen has been working at VIPKID for 6 months and just signed a new 6-month contract. She loves to teach kids English online! Here’s what Jen has to say about making money teaching English online. How did you get started with VIPKID? My husband saw an ad for VIPKID and thought it would be something I’d be interested in. I am a 5th-grade teacher and I’m always looking for part-time work. At the same time, I never wanted a part-time job that I didn’t enjoy or that I felt was consuming my very little free time. What interested you about getting to teach kids English online? I really liked the idea that I would be able to make my own schedule. I also really loved the idea of teaching English to Chinese students online. I’m half Chinese and I thought it would be a really cool connection to my dad’s home country. Everything moved along pretty quickly. Their communication was very thorough throughout the process. Once I submitted basic information, I was scheduled for an interview with someone at the home office in Beijing. During the interview, the representative took notes as she asked me questions about my education and teaching experience. My rate per class was determined after my interview (they also provide incentive bonuses based on participation). After the interview, I waited about a day for an email to tell me that I had passed through to the next level. It was time to schedule my mock lesson. During the mock lesson, I had to teach two lessons at different levels to an experienced VIPKID teacher. She was really nice and she was from the Midwest like me so it made me feel comfortable. She was super supportive. I only waited about a day before I received the email saying that I passed the mock lesson and my contract was ready. Hooray! I was very excited. I remember feeling like I was about to start a new adventure. I teach English lessons to children in China with varying levels of English ability. Each lesson is 25 minutes. As students move up in the levels in VIPKID, they are able to read more difficult words, answer more difficult reading comprehension questions, and extend their conversational language. When I teach the lessons, I start with a greeting and introduce the reward that the student will be getting throughout the lesson. They receive stars on the VIPKID platform which they can use to cash in for prizes, but it is also highly suggested to use your own reward to go along with it. To make it simpler and to help me manage my time, I give a star every five minutes. When I give them a star, I also automatically give them my own reward. I’ve been using these super cute monsters that I got at Target. They came in a pack of 5 for $1! The lessons that I teach mostly center around phonics, being able to answer questions about yourself in English, reading comprehension, and some math. Are there any costs involved to teach kids English online? There aren’t any costs that are required, but I would suggest buying some props to use during lessons. Things you would want to use for rewards such as a small dry erase board, a pretend microphone, etc. I tend to buy new props and rewards at the Dollar store or at the Target dollar spot. What are the positives about your job? I love having “regulars”! I have a few regulars or repeat customers, now and it’s so fun watching them grow in their English skills. It makes me feel so happy to see and hear their reading and speaking improve, as well as their ability to carry on a side conversation. I also really love that I have finally found a side hustle that fits perfectly with my schedule of being a public school teacher. Pay is between $7-9 per 25-minute class plus $2 per class if you meet a minimum of 45 classes each month and are on time. It equals to roughly $22 an hour if you do two, 25-minute classes per hour. VIPKID pays once a month via direct deposit. You can apply at VIPKID here. More about Jen: She is a teacher, a runner, and Whole 30er! She grew up in Aurora, Illinois and now resides in Northwest Indiana. Jen loves cooking, hiking, running, trying new restaurants, and spending time with family and friends! She has a great blog where she mostly blogs about cooking and eating healthy. So what do you think? Do you want to teach kids English online? Do you have any more questions for Jen? What a great position for someone who works from home! What a great way to earn money from home. Plus, it’s pretty great teaching English! Thanks for sharing. 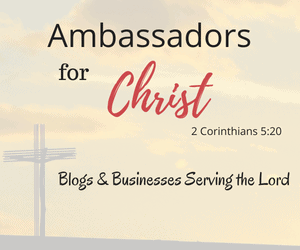 I added this post to StumbleUpon and Twitter — others can benefit from this too. How cool is this? What a great thing to do and get to work from home! OMG I literally just applied for them a couple of days ago. Definitely a great source of income.